Stripes, J. (2018). Native Americans: An overview. In S. Bronner (Ed. ), Encyclopedia of American studies. [Online]. Johns Hopkins University Press. Available from: https://search.credoreference.com/content/topic/american_indians [Accessed 25 April 2019]. Stripes, James. "Native Americans: An Overview." Encyclopedia of American Studies, edited by Simon Bronner, Johns Hopkins University Press, 1st edition, 2018. Credo Reference, https://search.credoreference.com/content/topic/american_indians. Accessed 25 Apr. 2019. The original peoples of North America collectively have been called Native Americans, American Indians, or Amerindians. These terms are European American inventions that obscure the diversity of peoples indigenous to the Americas. Members of many tribes, or First Nations, often embrace these terms but prefer their tribal names, such as Nee-Me-Poo (Nez Perce), Anishinabeg (Chippewa), or Tohono O'odham (Papago). Prior to the European conquest North America was characterized by an immense variety of languages, of material culture, of religions, of governance, and of economic relations. Originally there were close to three hundred distinct aboriginal languages spoken in North America, many more languages than in Europe. Linguists have organized these languages into fifty-seven families, further classified into six phyla, plus isolates. Most of these languages have become extinct or now lack communities of fluent speakers. The Diné (Navajo) have the greatest number of fluent speakers, with more than one hundred thousand who speak the language. Culture areas are broad regions with generally similar ecological conditions and common characteristics in the economy of food production. They offer a familiar organizational scheme for anthropological works, histories, academic texts, and reference books. This scheme's strength is its emphasis on the interrelations of economy, politics, religion, and material culture. Its chief weakness is the tendency toward overgeneralization. The narrative that follows, which largely adopts this scheme, suggests some of the larger patterns through selective examples. The culture areas are California, Great Basin, Southwest, Southeast, Plateau, Northwest Coast, Subarctic, Arctic, Prairie and Plains, and Northeast. Each of these areas can be subdivided along such lines as geographical features and language families. Questions regarding Indian origins have provoked speculation through five centuries with conflicting theories rooted in divergent epistemologies. The indigenes of North America know their origins on this continent; American Indian orature offers accounts that are closely linked to specific geographic features in the places of present occupation. Native peoples might have entered the Americas ten thousand to fifty thousand years ago, as orthodox archaeologists assert. The common theory holds that fewer than thirteen thousand years ago aboriginal Americans entered the continent from Asia across a land bridge where the Bering Strait is today and then migrated through an ice-free corridor into the interior of North America. This land connection had been proposed by the Jesuit theologian and missionary José de Acosta (Historia natural y moral de las Indias, “Natural and Moral History of the Indians,” 1590), whose views accorded with the 1537 declaration of Pope Paul III that Indians are human, hence descendents of Noah. This view gained scientific currency through observation of morphological similarities between American Indians and certain Asian peoples. Critical supporting evidence then emerged from the interpretation of archaeological sites throughout the continent where Clovis (Palaeo-Indian) points (11,500 years old) have been unearthed. However, later excavations in the United States, Venezuela, and Chile have produced an array of pre-Clovis artifacts. The Bering land-bridge hypothesis is undergoing revision as some archaeologists advocate a model of multiple migrations. Sioux scholar Vine Deloria, Jr., asserts that the land-bridge hypothesis is an example of the systemic structures of racism that inform the production of knowledge about American Indians. In Red Earth, White Lies (1995) he suggests that archaeologists employ peer pressure more than reasoned argument, that their interpretations ignore contradictions, and that the hypothesis is rooted in systematic dismissal of tribal peoples' own stories of origins compounded by tacit acceptance of European mythology. He urges scientists to develop new research questions out of efforts to comprehend prehistoric events that are alluded to in indigenous stories. Transoceanic voyages might account for some ancient migration to the Americas. Widespread stories of floods in indigenous orature could offer clues to and support for this possibility or for the emergent coastal migration hypothesis. For example, the Tewa origin myth recounts an emergence out of water where darkness prevailed. Could these details reflect conditions along the coast of Beringia? Archaeologists are developing new relationships with Native peoples, in part owing to parameters established by the Native American Graves Protection and Repatriation Act (1990). Sometimes these relations reveal deep divisions in the cultural politics of interpreting the ancient past, such as when nine scholars filed a lawsuit to gain access to the nearly nine-thousand-year-old skeletal remains called Kennewick Man. Estimates of the population north of Mexico before colonization have ranged from a now thoroughly discredited estimate of one million persons to more recent estimates as high as twelve million. A consensus is developing in favor of a figure of five to eight million. The methods employed to achieve this estimate yield comparable estimates of forty-five to sixty million for the Western Hemisphere, perhaps one-fifth of the earth's population in 1492. All recent estimates account for the effects of massive depopulation from epidemic disease. Diseases such as smallpox, measles, influenza, bubonic plague, diphtheria, and many others spread with the advance of direct European contact. American Indians had no prior exposure to these diseases and hence greater susceptibility. Most communities endured repeated epidemics over several generations. In some cases, such as the mysterious cold sickness (possibly malaria) among the Chinookan peoples of the lower Columbia River in 1830–1832, mortality exceeded ninety percent. Major epidemics spread throughout the Southeast during and after the expedition of Hernando de Soto (1540–1541). Epidemic disease was the decisive factor in the European conquest. Epidemics not only eliminated entire communities, but the resulting sociocultural disruption also created conditions that made Native peoples more receptive to European trade items and religious ideas. From the beginnings of colonization European cosmologies and economic ambitions structured their perceptions of the indigenous inhabitants of the Americas. The Europeans brought soldiers, missionaries, livestock, alien plants, diseases, and manufactured goods. They extracted gold, furs, human labor, and such crops as corn (maize), potatoes, and tobacco. The exchange of goods and peoples enriched Europe but devastated the peoples and lands of the Americas. The conquest was more a matter of ecological imperialism and cultural transformation than a consequence of European political, economic, and technical supremacy. The European invasion began early in the sixteenth century with the Spanish in what later became Florida and California, and the Southwest, and with the French in the Northeast. English explorers were not far behind along the eastern seaboard, and their methods of settling whole families eventually gave them the edge over other Europeans. In the early seventeenth century the Russians established a presence in Alaska and along the Northwest Coast. Spanish colonization of what became the United States began with efforts to conquer Florida but was most extensive in the Southwest and California. Densely populated California was extremely varied, including perhaps thirty-seven language families, extensive ecological diversity, and a variety of house types, including earth lodges, plank houses, grass and reed structures, and other forms. Political units consisted of small numbers of linked villages and larger groups along river valleys in the interior, such as the Yumans along the Colorado River valley, who made use of annual floods for agricultural cultivation. Along the coast and rivers people harvested abundant marine and freshwater fish and other aquatic species, while hunting of deer and small game was an important element of the diet inland. Fire was used to nurture deer habitat, as well as to promote growth of clover and other grasses. Native Californians harvested acorns, plums, and similar crops. In contrast, the neighboring Great Basin was sparsely populated. There loosely organized bands of relatives living near each other would join together for such activities as gathering pine nuts and camas, cultivating corn and beans, or driving into a corral rabbits, antelope, or mountain sheep. Seasonal travel to the locale of various foods was the norm. Before the arrival of Europeans the Southwest was characterized by cultivation of corn, beans, squash, gourds, and cotton. Hunting provided additional sustenance. The Spanish introduced domesticated sheep, horses, and other livestock, as well as peaches and apricots. Uto-Aztecan speakers in the south include the Yaqui and O'odham, whose Hohokam ancestors built extensive irrigation systems in the Gila River basin beginning about 300 B.C. ; The Pueblos in the east represent four major language families. They traditionally depended on rainfall and controlled flooding for cultivation supplemented with hunting. The oldest continually inhabited towns in North America are the Hopi and Acoma Pueblos. These were built during an era of expansion of towns and trade networks that also marked the apex of the Anasazi, circa 900–1200. The adobe construction of the pueblos became the model for what has become the modern Southwest architectural style. La Relación (1542) by Álvar Núñez Cabeza de Vaca and his companions describes the first foray of the Spanish into the Southwest. Several unsuccessful conquistadors followed them until Juan de Oñate brought the Pueblos under Spanish colonial authority. In 1680 the Pueblos briefly united behind the leadership of Popé and drove the Spanish out of New Mexico, but the colonizers returned fifteen years later. Political and economic subordination of Native peoples in the Southwest has remained a central fact of their existence since the beginning of the eighteenth century. As the Spanish enforced Catholicism, many Native ceremonies were performed secretly. Other ceremonies took new external forms, investing Catholic rituals with indigenous meanings. The resulting complex fusion of indigenous and introduced belief systems forms the heart of contemporary Native religious and ceremonial practices in the Southwest. Native cultures have persevered through immense change and continue as a major influence on the cultural development of more recent immigrants to the region. In the Northeast, French, Dutch, and British colonizers established trade relations with several tribes. Europeans offered metal knives, axes, and cooking pots as well as glass beads and guns in exchange for furs and often meat and corn. Competition intensified intertribal conflicts as those well positioned to serve as middlemen strove to prevent direct European trade with their suppliers, or with their enemies. As Europeans sought better prices for furs and grew in power, they circumvented their trade partners, establishing new trade relations ever deeper into the interior of the continent. By the early seventeenth century French trade and missionary enterprise was centered in towns of the large and powerful Huron confederacy. However, in the late 1640s the combined effects of epidemic disease, decline in the resources that sustained the fur trade, and attacks by the Iroquois effectively eliminated the Huron as a major political force. Firearms were inferior to bows and arrows in rate of fire, accuracy, reliability, and cost but were more deadly at long range. In any case, Natives sought guns and other implements of European technology, facilitating expansion of European trade networks. As trade relations with Europeans became the dominant aspect of Native diplomacy and economically motivated intertribal warfare grew more intense, Europeans prospered at the expense of Natives. Economic and spiritual life in the Southeast centered on farming and hunting. The ripening of new corn was widely celebrated in the annual Green Corn ceremony. Tobacco cultivation was widespread and was important ceremonially. Early Europeans failed to comprehend indigenous farming methods, which appeared inefficient. Natives planted small hills with beans, corn, and squash together so corn stalks could double as bean poles while squash filled the space in between. Beans slowed the corn's depletion of nitrogen from the soil, enhancing yields. Although the cultivation of larger sections of land initially boosted European American yields, they could not exceed aboriginal rates consistently until the advent of chemical fertilizers in the twentieth century. Political organization was structured around a complex system of alliances among towns and internal tensions between war clans and peace clans. Disputes that could lead to warfare were often settled through lacrosse competition. New towns defeated by the Muskogee Confederacy (Creek) were brought into alliance through the establishment of clan affiliations. As in the Northeast, the arrival of Europeans inaugurated a complex system of trade alliances with the newcomers, intensified conflicts between Native groups, and placed growing pressure on the natural resources, in this case deer, on which Natives relied for trade. After playing French, British, and Spanish merchants against one another, Southeast Indians lost the advantage with the ascendancy of Britain. Images of Indians that have prevailed in American popular culture since the late nineteenth century derive from a short-lived Plains culture. This culture developed on the Northern Plains, particularly among the Sioux, Cheyenne, and Crow, with their acquisition of guns and horses in the last quarter of the nineteenth century. It centered on hunting bison and gathering berries and roots. Although today's Lakota (the Western Sioux) maintain that their people originated in the Black Hills, archaeologists and linguists trace their origins to the Mississippian Culture. In any case, the Sioux enjoyed a brief period of expansion and prosperity commensurate with the decline of horticultural nations that had occupied part of the Northern Plains in the previous centuries. The Sioux were at the height of their power when they, and their Cheyenne allies, defeated George Armstrong Custer at the Battle of the Greasy Grass (Little Big Horn). However, they could not sustain themselves against the U.S. form of warfare: systematic destruction of villages and food stores and unceasing assault on the resources of the land, including deliberate efforts to extinguish the bison. On the Plateau indigenous peoples lived in permanent winter villages along waterways and traveled through a seasonal pattern to the sources of foods. From the harvesting of bitterroot in spring, to camas fields in summer, and then into the mountains for huckleberries, the women gathered foods, which were then dried for preservation and to reduce the weight for transporting to the winter villages. Meanwhile, men harvested runs of salmon and eels or hunted deer and elk. Celilo Falls, destroyed in 1957 by the Dalles Dam, was the most productive salmon fishing spot in the Northwest. Hence, it became the center of trade for the exchange of goods from California, the Northwest Coast, the Plains, and the Plateau. Villages, which were the basic political unit, were led by councils and a headman or chief who earned his position through generosity. Limited to particular areas of authority, chiefs held their positions only for the duration of a specified activity, such as a war party or a bison-hunting expedition to the Plains. The Northwest Coast, one of the most culturally complex indigenous societies worldwide, is also characterized by immense language diversity with four major language families and several isolates. Cedar trees provided lumber for houses and canoes, and the bark was softened and woven into fabric for mats, blankets, hats, and other uses. Migrating salmon provided a rich supply of easily obtained food, supplemented with other fish, large game animals, roots, berries, and other plants. Marine mammals—whales and seals—provided an additional source of meat, as well as oil for cooking and light. Oolachen (“candlefish”) were harvested for their oil. Some communities erected poles and nets in the flight path of waterfowl. Typically the members of one clan in a village lived in one house and were self-governing. The relationship among the different clans, or houses, of a village, as well as between villages, was well established as a matter of rank. These relations were maintained through diplomacy and feasts, called potlatches among some tribes. These feasts were also a time for storytelling and dances. Houses faced the sea, reflecting the spiritual order of the relations between the underworld, ruled by Killer Whale, and the forest and sky-world, ruled by Thunderbird. Totem poles, often erected as part of a house, presented a visual reminder of the history of the clan from its origins to the present. From the beginnings of colonization, tribal peoples have employed a multitude of strategies to defend their rights to self-determination. In 1535 Donnaconna, head of the Stadaconans, employed the threat of divine retribution in efforts to dissuade Jacques Cartier from continuing up the St. Lawrence River. Beginning in 1607 Wahunsonacock, called Powhatan by the English, courted the newcomers as allies in the quest for advantage over his enemies the Chesapeakes. After his death, and the death of the charismatic prophet Nemattanew, his brother Opechancanough led a military assault in 1622, nearly eliminating the Virginia colony. This war, like King Philip's War in New England, provided English colonists with the material they craved to confirm their stereotypes of the Native peoples. European colonists survived through purchase and theft of Indian corn, while constructing stereotypes of tribal peoples as primitive hunters and gatherers who had a penchant for unprovoked violence. One of the chief colonial notions, categorization of all indigenous peoples as essentially alike, persists in our time. To meet certain needs Native peoples sometimes have adopted European ideas. The term Indian as a unifying label achieved its first widespread acceptance by tribal peoples during efforts to revitalize Native culture, throw off all things European, and drive Anglo-Americans back across the Appalachians. Such nativist prophets as Tenskwatawa, Neolin, and Wangomend sought spiritual and political unity among Indians and a return to traditional ways. Some of their opponents sought to protect village or tribal integrity, opposing pan-Indian gestures while selectively accepting items provided by European technology—metal knives, pots, guns, plows, and the like. Throughout the nineteenth century, European Americans proved adept at exploiting internal tribal conflict, intertribal rivalries, and the personal ambitions of individual Indians. Often Natives expected considerations as a result of such alliances and were disappointed, such as when President Andrew Jackson refused to assist those Cherokees opposing removal who had secured his victory over the Red Stick Creeks. Tribes in the East, with few exceptions, disappeared as viable communities or moved to the ever-shrinking area called Indian Territory. Tribes west of the Mississippi River, on the other hand, secured ever-shrinking fragments of their original homelands through treaties. Federal and church-run boarding schools became the experience shared by most tribal children from the late nineteenth century well into the twentieth century. This experience, rooted in explicit political efforts to destroy tribal self-government, cultivated a blending of distinct peoples that gave new meanings to the term Indian. One consequence was the beginning of pan-Indian organizing in a modern political framework. The Society of American Indians, created in 1911, embraced and promoted the U.S. policy of assimilation but also struggled on behalf of Indians' civil and human rights. The Alaska Native Brotherhood, working in a regional context, pursued similar goals, including the right to vote. In 1944 a group of highly educated Indians, mostly employed by the Bureau of Indian Affairs, formed the National Congress of American Indians, an important advocacy and lobbying organization. Native America has become increasingly urban owing to trends in the U.S. population as a whole and as a consequence of policies in the 1950s aimed at promoting the disappearance of America's first peoples. In the San Francisco Bay Area in the early 1960s, a group of Sioux made several efforts to claim Alcatraz under terms of the Fort Laramie Treaty of 1868. These terms, allowing the possession of abandoned federal property, had been written because the Sioux prevailed in the Powder River War in their efforts to force the United States to abandon forts along the Bozeman Trail. In 1969 a group that named itself Indians of All Tribes made another effort and held the former prison for nineteen months. Their tactics influenced the nascent American Indian Movement (AIM), which had been created in 1968 in Minneapolis to address local urban Indian issues. AIM forged new alliances across tribal boundaries and between urban mixed bloods and traditionalist full bloods residing on reservations, and it facilitated a renewed sense of confidence among Indians. Reservations in the early twenty-first century offer vital centers for maintaining tribal values in the modern world. Many are among the poorest communities in North America, but some are finding economic growth in tourism and gambling. Some are diversifying their economies. For example, the combination of logging, ranching, tourism, and gambling makes the Colville Confederated Tribes the largest employer in north-central Washington state. Members of tribal governments are finding new ways to affirm traditional values and inherent sovereignty, while asserting leadership in a changing America. Chief Justice Robert Yazzie of the Navajo Supreme Court, for example, translates traditional Navajo peacemaking into Western legal language and processes, pursuing what he calls the development of Navajo common law. Indians are now employed in the vast majority of positions in the Bureau of Indian Affairs. A multitude of Indian, intertribal, and tribal organizations work toward specific objectives, employing Native lawyers, scientists, administrators, and other professionals. For example, the American Indian College Fund raises money for scholarships and academic programs. The Columbia River Intertribal Fish Commission represents the interests of four nations with treaty-protected interests in the aquatic resources of the Columbia River, including salmon. The Gray Eagle Society, which conducts its meetings in the Lakota language, works toward restoration of the Black Hills. 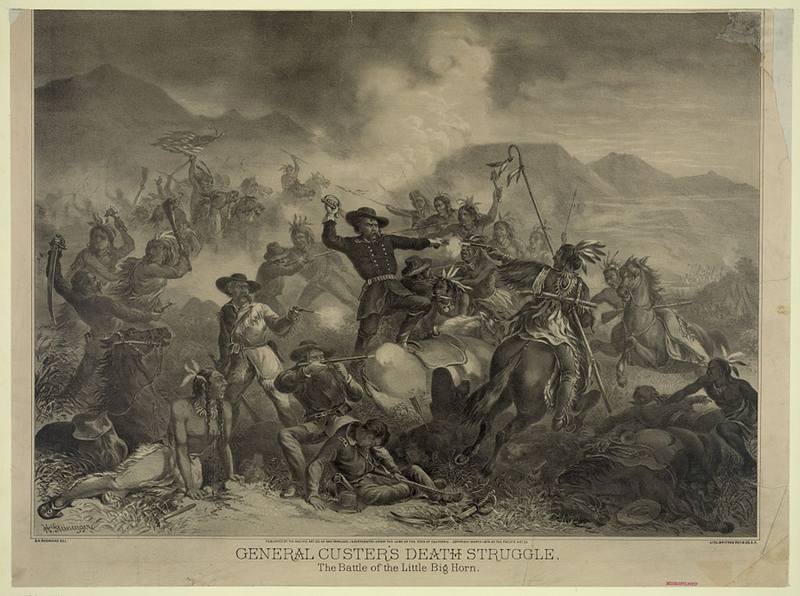 General Custer's Death Struggle: The Battle of the Little Big Horn. Lithograph, 1878. H. Steinegger. S. H. Redmond, artists; Britton, Rey & Co., printers. Library of Congress. 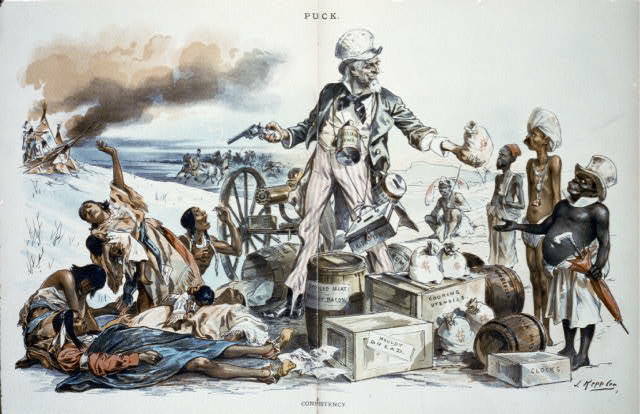 “Consistency.” Satire on Uncle Sam's benevolence toward Africans, Asians, and Europeans while massacring American Indians at Wounded Knee. Color lithograph, 1891. J. Keppler, lithographer. Illustration from Puck, Jan. 21, 1891, pages 372-373. Library of Congress. Navajo man in ceremonial dress representing the Yebichai god Zahabolzi (Zahadolzha?). 1904. 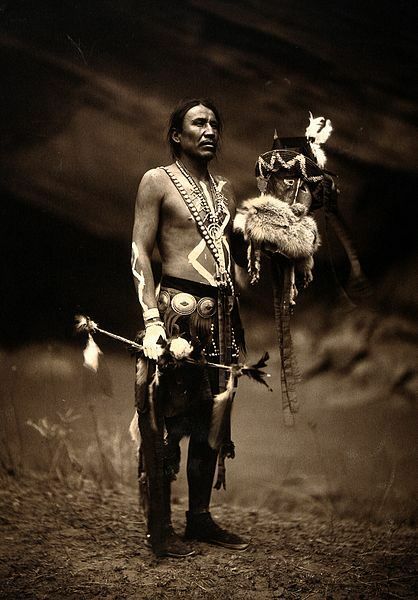 Edward S. Curtis, photographer. Wikimedia Commons. Calloway, Colin G., One Vast Winter Count: The Native American West before Lewis and Clark (Bison 2006). Carstarphen, Meta G.; John P. Sanchez, American Indians and the Mass Media (Univ. of Okla. Press 2012). Champagne, Duane, ed., Native America: Portrait of the Peoples (Visible Ink Press 1994). Crosby, Alfred W. Jr., Virgin Soil Epidemics as a Factor in the Aboriginal Depopulation in America, William and Mary Quarterly, 3d series, 33 (1976): 289-299. Deloria, Vine Jr., Red Earth, White Lies: Native Americans and the Myth of Scientific Fact (Scribner 1995). Dowd, Gregory Evans, A Spirited Resistance: The North American Indian Struggle for Unity, 1745-1815 (Johns Hopkins Univ. Press 1992). Given, Brian J., The Iroquois Wars and Native Arms, in Native People, Native Lands: Canadian Indians, Inuit and Metis, ed. by Cox, Bruce Alden (Carleton Univ. Press 1988). Green, Michael D., The Politics of Indian Removal: Creek Government and Society in Crisis (Univ. of Nebr. Press 1982). Grounds, Richard A., et al., eds., Native Voices: American Indian Identity and Resistance (Univ. Press of Kan. 2003). Hatch, Tom, Osceola and the Great Seminole War: A Struggle for Justice and Freedom (St. Martin's 2012). Kehoe, Alice Beck, The Ghost Dance: Ethnohistory and Revitalization (Waveland 2006). Mielke, Laura L., Moving Encounters: Sympathy and the Indian Question (Univ. of Mass. Press 2008). O'Gorman, Edmundo, The Invention of America: An Inquiry into the Historical Nature of the New World and the Meaning of Its History (1961; Greenwood Press 1972). Ortiz, Alfonso, The Tewa World: Space, Time, Being, and Becoming in a Pueblo Society (Univ. of Chicago Press 1969). Owings, Alison, Indian Voices: Listening to Native Americans (Rutgers Univ. Press 2012). Ray, Arthur J., I Have Lived Here since the World Began: An Illustrated History of Canada's Native People (Lester Pub./Key Porter Bks. 1996). Rifkin, Mark, When Did Indians Become Straight? Kinship, the History of Sexuality, and Native Sovereignty (Oxford 2011). Shoemaker, Nancy, ed., Clearing a Path: Theorizing the Past in Native American Studies (Routledge 2001). Sioui, Georges E., For an Amerindian Autohistory (McGill-Queen's Univ. Press 1992). Sturtevant, William C., ed., Handbook of North American Indians, 29 vols. (Smithsonian Inst. Press 1978-1998). Thornton, Russell, American Indian Holocaust and Survival: A Population History since 1492 (Univ. of Okla. Press 1987). Vizenor, Gerald, The People Named the Chippewa: Narrative Histories (Univ. of Minn. Press 1984). White, Richard, The Roots of Dependency: Subsistence, Environment, and Social Change among the Choctaws, Pawnees, and Navajos (Univ. of Nebr. Press 1983). Wilson, James, The Earth Shall Weep: A History of Native America (Grove 2000). Member of an American Indian people who lived in central New York State and belonged to the Iroquois confederacy. They speak an Iroquoian language.